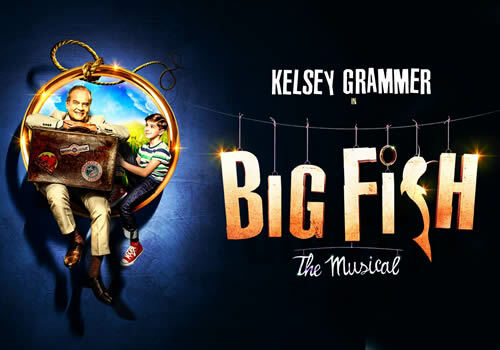 Multi-award winning actor Kelsey Grammer stars in the London premiere of John August and Andrew Lippa's Big Fish the Musical. A celebratory musical about a zest for life, the production plays a limited Christmas season at Andrew Lloyd Webber's The Other Palace, as part of the venue's initiative to stage new writing and little-known musicals. Based on Daniel Wallace's novel of the same name, which was later adapted into a Tim Burton film, Big Fish is the story of Edward Bloom, an ordinary man and extraordinary father. After years of telling his son tall tales about true love, beauty and wild imagination, Edward's son confronts him in order to find out the difference between truth and fiction. Soon, the pair go on a life-affirming journey that changes them both forever. Tony Award-nominated actor Kelsey Grammer stars as Edward Bloom, with Broadway credits including La Cage Aux Folles and Finding Neverland. Grammer is best known for his role as Dr. Frasier Crane in NBC sitcoms Cheers and Frasier, for which he earned three Golden Globes and five Emmy Awards. Clare Burt stars opposite as Sandra Bloom, with previous credits including Flowers for Mrs Harris and London Road. Further cast members include Matt Seadon-Young (Beautiful, Les Miserables) as Will Bloom, Frances Mcnamee as Josephine Bloom, Forbes Masson as Amos/Don, Jamie Muscato as Edward, Laura Baldwin as Sandra, Landi Oshinowo as the Witch/Jenny Hill, Dean Nolan as Karl and George Ure as Zaki. Additional casting includes Sophie Linder-Lee, Gemma McMeel and Jonathan Stewart. Big Fish the Musical is from Tony Award-nominee Andrew Lippa (The Addams Family), with a book by John August (Charlie and the Chocolate Factory). Directed by Nigel Harman, the production features design by Tom Rogers, choreography by Liam Steel, lighting design by Bruno Poet and video design by Duncan McClean, with sound design by Luke Swaffield and Avgustos Psillas for Autograph. Playing for a strictly limited festive season at The Other Palace, the reverential, exciting new musical runs from November 1st to December 31st 2017. Big Fish the Musical is suitable for all ages.